Pablo Solis, manager of the Palmdale HomeTown Buffet, was the grand prize winner of a new car at Buffet Inc’s Company Paid Vehicle (CPV) event in Las Vegas. Solis and 21 other General Managers were honored at the CPV, which recognizes managers who have significantly increased profits over the past year. LAS VEGAS — Hard work and dedication paid off recently for the general manager of the Palmdale HomeTown Buffet. For his role in increasing his company’s profits over the past year, Pablo Solis was gifted with a brand new car. Solis was one of 22 top performing managers recognized at a convention in Las Vegas hosted by Buffets, Inc. – parent company to steak-buffet chains HomeTown Buffet, Old Country Buffet® and Ryan’s. For demonstrating a substantial increase in profits from last year, the honorees received a free one-year lease on a new 2014 vehicle of their choice: Nissan 370Z, Ford F150 XLT, Chevy Camaro coupe, Chevy Camaro convertible, Volvo XC90, or Mercedes Benz CLA. One lucky manager was selected at random to receive a brand new car to own. 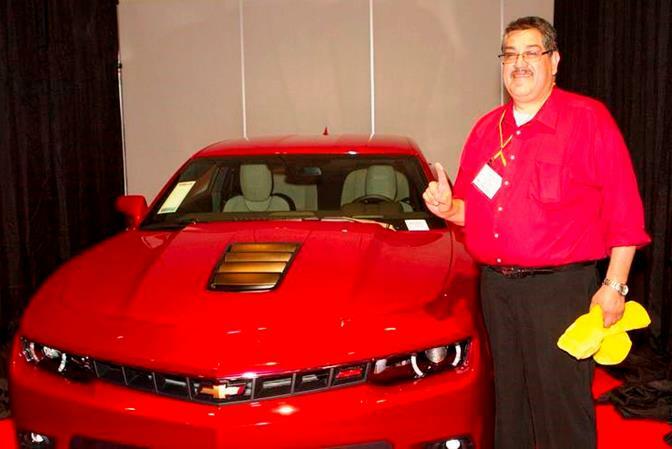 Solis was the grand prize winner, and he selected a Camaro coupe as his prize vehicle. 10 comments for "Palmdale HomeTown Buffet manager wins new car"
Pablo is a great guy, sometimes you run into a bad worker, but if you ask for Pablo and speak to him, he makes it right. He even honors coupons that are expired or will honor a dinner one for lunch. He’s a great guy. Congrats to the Pablo! I can see why he was award this car…. he’s great at what he does, me and the family go there about 2 times a month and the sevice is always great! We get greeted when we get there and they thank us when we leave. I myself is in the restaurant business and let me tell you we get it all from customer complaints to customer telling us we’re the best. Your always gonna have unhappy customer becuase thing will go wrong…but that does’nt make him a bad manager. Keep it up Pablo you’re doing a great job and you have an awesome team! Wish he’d manage HTB a little better though. Ever since Lancaster’s HTB closed, Palmdale’s HTB has gone down hill!!!!!!!!!!! Agreed. I went there for the last time the other night. The food quality and service has been substandard compared to the old Lancaster HTB since day one (these guys never could figure out how to make decent breakfast). This last time, I heard the prices they charged for dinner for 2 people – without drink service – and it was so high that I and my guest simply walked out and went to restaurant row where we had a higher quality dinner, better service, and paid slightly LESS! Pablo doesn’t give a damn about making the customers happy – never has. Some customers r never happy so just stop hating n b happy for others!!! He was my boss n he is great n desrves what he got…. I don’t know who Pablo is but the staff is always friendly and cheerful even when it’s very busy. So, I’m guessing that he is able to create that kind of environment in a large, casual restaurant, a buffet at that. There is another buffet in the Valley that has good food but the staff is just the opposite of HTB. It really affects the experience. I note that it is not customers disagreeing with my experiences. By the way, I am NOT complaining about the table service as it is pretty good. My complaint is primarily regarding Pablo’s lack of customer service skills. The customer is NOT always right. I learned that working in customer service. There are always two sides to every story. You treat people how want to be treated, one thing I know that there are certain groups of people who just bicker at every little thing. Doesn’t matter what it is. Pablo’s customer service is great if you are a great customer. If you’re not, then maybe you should look at what you’re doing wrong as a customer. I think he has great people skills and he puts up with a lot of difficult clientele. I as a regular customer notice the type of people that can make having a simple meal a difficult experience, what I noticed about this man is that he will not let the customer walk all over him if he doesn’t feel that they are right in the situation. So great job Pablo! Keep up the great work, don’t let the negativity affect your management and customer service skills, most people don’t know what it is like to work with customers. Oh and by the way, the prices changed in all the HTB restaurants not just the Palmdale one. Get out of your valley. I am glad that Pablo won, he always gives achievement certificates to students.